A Chinese airline manufacturer has been selling, and in some cases giving away, an airplane that was rejected by the country’s own aviation industry for safety fears. The first sign of trouble took place on June 22, 2000, when a plane called the Y-7 suffered a disastrous accident at an airport in the central Chinese city of Wuhan, killing the 44 passengers and crew onboard and 7 others on the ground. The accident was later blamed on inclement weather, but from that point on the Y-7 was effectively banned in China. Then, the plane’s manufacturer installed a Canadian engine and a U.S. propeller, added 20 seats, and redecorated the interior: The MA60 was born. Both planes came from a reverse-engineered Soviet-designed military plane called the Antonov An-24. But the MA60 itself quickly got into trouble: In 2002, during a practice drill at the Yichang airport, again in Wuhan, the pilot failed to extend the landing undercarriage. The plane skidded along the runway on its belly, an occurrence that has been seen again and again with the MA60 over the years. The upshot of this incident, and the 2000 tragedy, was that the MA60 became a pariah in China. Domestic companies felt more comfortable with Boeing and Airbus. The next step for Xi’an Aircraft Industrial Corporation, the state-backed maker of the planes? Begin exporting the MA60 overseas, mostly to Southeast Asian countries. In some cases the planes are even given away. The record does not look good. The problem was highlighted abruptly in June with two incidents, on the same day, in Indonesia and Burma. On June 10, a Chinese-made MA60 propeller aircraft with 50 people on board snapped in two after crash-landing on its belly at an airport in eastern Indonesia. “We were very surprised,” said Imam Purnomon, the airport manager, to local media. “The front wheels broke, causing the two propellers to break, too, when they hit the ground.” No one died, but two passengers suffered minor injuries. 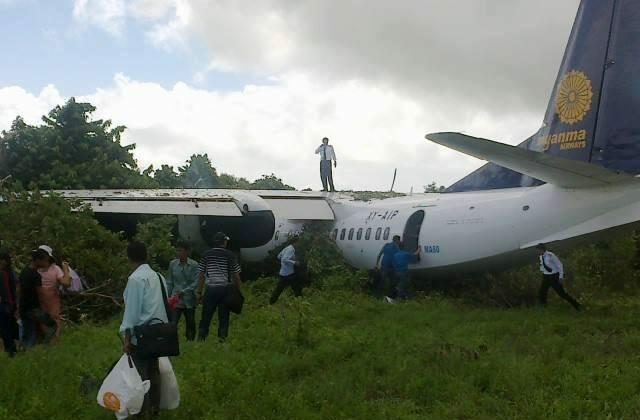 Then, on the very same day, an MA60 operated by Myanma Airways, a Burmese state airline, carrying around 60 people (the plane’s capacity) skidded 200 feet off the runway at a domestic airport in southern Burma. Nobody was hurt, but Burmese authorities grounded all the country’s MA60s for inspection. Most recently, the government of New Zealand suspended millions of dollars in tourism aid to Tonga because it was concerned about the safety of the Xi’an’s MA60, which was gifted by China in a ceremony to Tonga’s king. The ceremony and the gifting highlights the political role the aircraft plays in Chinese diplomacy. The plane is sold at a deep discount and other times given away. State media reports market the craft as the flagship of the country’s burgeoning aviation industry. Safety issues have dogged the MA60 ever since it went into production. According to a summary of the craft in “Ready for Takeoff: China’s Advancing Aerospace Industry,” a book about China’s aviation industry, the plane was cited for “reliability problems and two runway overruns,” leading to its withdrawal from service by 2006. Yu Dawei, a reporter for the Chinese business magazine Caixin, writes that Sichuan Airlines rejected the first MA60 it received, after finding takeoff problems in its tests. Only nine MA60s were sold in China, Yu writes, but none of them are flying now, since it was withdrawn from service to make way for the new model MA600. But as the plane was being rejected and pulled from service in China, it was being sold overseas, and received laudatory reports about its prowess in China’s state-run media. “Self designed and produced, the MA60 has had many firsts in the history of China’s civil aviation industry,” said a reporter with China Central Television, in an English-language advertisement for the aircraft packaged as news. After passing flight tests in Indonesia in 2006, the report said, it became the first Chinese plane in the overseas market. “It paves the way for further imports to Southeast Asian countries,” CCTV said. In the same year Merpati Nusantara Airlines, a large carrier in Indonesia, bought 15, the “largest deal in the history of China’s civil aviation industry,” CCTV said. People’s Daily, the official mouthpiece of the Chinese Communist Party, said that “more than 400” are expected to be put on order over the next 20 years. A litany of accidents, listed on airforceworld.com, a Chinese aviation resource website, may indicate why. In 2009 at the Caticlan Airport in the Philippines, the undercarriage of an MA60 that was landing clipped a guard rail, spinning the plane harshly to the left and smashing through a runway fence. At the Harare airport in Zimbabwe, also in 2009, as one of the planes was taking off, it apparently hit a warthog on the runway, collapsing the undercarriage and causing it to spin out of control. Some of the passengers later didn’t buy the warthog explanation. A total of 10 incidents are listed, with specific dates, and often airplane flight and registration numbers. Three took place in China, while the others all happened overseas. According to Aviation Week data, there are 30 MA60s in service, 27 outside of China. Some of the incidents appear to be due to pilot error, and Indonesia is known for its poor aviation safety record, but an incident rate of one-third is unusual in the industry, according to aviation safety experts. Still, the planes were promoted by Xi’an, and its parent company, Aviation Industry Corporation of China, or AVIC, a massive state-owned conglomerate with over $50 billion in assets. At the Dubai Air Show in 2011, years after the issues with the plane were clear, AVIC was promoting the plane for sale. The extremely generous terms on which MA60s are offered could give some indication as to why they still reach the market. “Usually these aircraft are sold with financing at low interest rates,” said Roger Cliff, one of the co-authors of “Ready for Takeoff” and an expert on China’s aviation industry. “But particularly when talking about countries like Indonesia or Burma, we could think about other possible reasons for officials to purchase these aircraft,” Cliff said, like “bribes or other political motivations.” A fleet of craft may be sold on favorable terms as a sign of goodwill, for example—or in Tonga’s case, simply given away. The failed MA60 offers important lessons about China’s aviation industry and the political system it is connected to, according to a Chinese mechanical engineer that spent years in the state system in China, and who now is based in Melbourne, Australia. He only wanted to be identified by his surname, Sun. “The leaders in many large state-owned factories are communist officials, and for the sake of their promotion they concern themselves too much with successfully completing a product in a specified time and reaching a certain profit targets, so they don’t consider poor quality aircraft parts that would cause safety problems,” Sun said. Air holes that shouldn’t be there in a cylinder, for example, may get passed over by inspectors, Sun says. “Those who held the real power in the factories are often poor at a technical level,” he said. “The officials silence technicians that raise quality problems,” because correcting errors would mean lost bonuses and an embarrassment for factory leaders. A former pilot with China Southern Airlines told Epoch Times that Chinese airlines themselves typically decline to buy domestically produced aircraft, because of the way the aviation industry lags behind. AVIC International, the parent company of Xi’an Aircraft Industrial Corporation, which sells the MA60 overseas did not respond to a request for comment. Today’s globalized world means that problems with the planes in smaller countries like Indonesia and Tonga can have global impacts—New Zealand’s refusal to provide investment to Tonga for tourism a case in point. “If there were a problem with the airplane, then passengers would not have the same level of confidence of safety that they’ve come to expect in other parts of the world,” Abdu said. Karen Cheng and Lu Chen contributed to this report.